This video of the hard-driving bluegrass gospel medley, I’ll Fly Away, Hank William’s I Saw The Light & Somebody Touched Me is from The Cumberland Trio’s Sept 24, 2004 Back Where We Began reunion concert at the historic Bijou Theatre Center in Knoxville, TN. This is about as good a bluegrass gospel song medley/video as you will ever see. These guys from the ’60s folk era have reunited after 40 years and are just incredible. Their great website is www.cumberlandtrio.com. 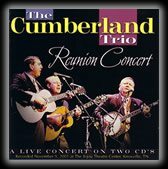 This entire 2 1/2 hour live concert DVD and double CD is available at www.cdbaby.com, type cumberland trio in the search box. ENJOY!!! !